The IMO’s MEPC 70 proposals for a marine fuels sulfur cap of 0.5% to be in place by 2020 have attracted severe criticism from several major stakeholders in the maritime sector, including the International Bunker Industry Association, the organization that defends the interests of bunker fuel suppliers. The IBIA has stated that several unknowns remain about the proposed limit and has asked whether assumed global capacity will translate into actual marine market supply in 2020: “Will refiners produce suitable fuels, and what will these fuels look like? Can the powers that be ensure compliance, and how will the IMO tackle transitional issues? We also don’t know to what extent the uptake of scrubbers and alternatives will impact overall demand,” stated the Association. Such questions and comments add to the disquiet over the issue expressed by the Baltic and International Maritime Council (BIMCO), as reported in Maritime Reporter & Engineering News last month (December 2016 issue, page 24). “Signals in advance that the entire European Union bloc wanted 2020, combined with the release of a new study suggesting delaying the sulfur cap to 2025 would cause more than 570,000 additional premature deaths globally, made it politically very difficult to ask for a delay. Even so, several countries did say 2020 would be too soon and wanted a 2025 implementation date, while some supported a phased introduction as proposed by IBIA,” its statement said. “Although the compliance date itself will be known well in advance, simple market economics leads us to believe that owners will not switch to far more expensive lower-sulfur fuels before they have to, resulting in a virtual overnight shift,” the IBIA’s IMO representative, Unni Einemo, told the Committee. The IBIA had therefore suggested a phased approach, bringing in the global sulfur limit over a period rather than on a specific date. The US Energy Information Administration has also commented on the implications of the new limit, noting in its publication This Week in Petroleum that ships also have the option of switching to new lower-sulfur blends or to nonpetroleum-based fuels. The Administration stated that vessel operators and shippers will likely be faced with higher costs as the sulfur content in marine fuels decreases and the role of distillate in the bunker fuel market increases. It quoted as an example of the kind of price difference between fuels that may be observed recent figures released by the Amsterdam-Rotterdam-Antwerp refining and trading hub in Northwest Europe, with 2016 prices for low-sulfur gasoil, a type of distillate, having averaged more than $20 per barrel above prices for residual high-sulfur fuel oil. The EIA concluded that fuel blends used to meet the new IMO regulations were likely to be priced somewhere between these two fuels. The IBIA also noted that when the emission control area (ECA) limit fell to 0.1% in 2015, the introduction of a range of novel fuel formulations that cost less than marine gas oil (MGO) was seen, pointing to a future where the global 0.5% cap would not rely on a wholesale switch to distillates, and stated that it is indeed likely that professional blenders and refineries will supply many new types of fuel blends to meet the 0.5% limit, including more widespread use of vacuum gas oil and the use of very-low-sulfur heavy fuel oil (HFO) where available with low levels of low-sulfur blend stock added. 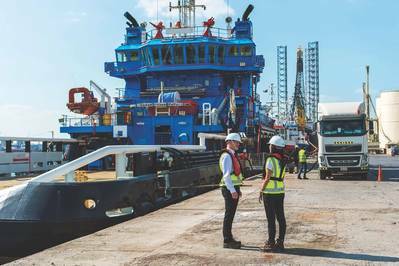 It also observed that some refineries were exploring opportunities to produce specific 0.5% marine fuels from existing product streams and that some refineries may desulfurise HFO, with a number of independent innovators looking to get into the marine fuel market through this route. The IBIA reminded the MEPC that while experience with these fuels had largely been positive, their use to date had not been entirely problem-free, a number of difficulties with new ECA fuels (NEFs) having been reported both in 2015 and very recently. Another issue is the enforcement of the regulations. Will enforcement be possible when ships are sailing on the high seas and will the IMO be able to ensure that it actually happens? The IBIA has stated that the current enforcement powers are not strong enough and that low levels of policing will enable some operators to avoid complying simply because they will not be prosecuted. This will distort the competition landscape with an uneven playing field between compliant and non-compliant operators. To address these issues, the IBIA co-sponsored MEPC 70/5/2 calling for the IMO to consider how PSC officers can detect and take action against ships using fuel oil that exceeds the 0.5% limit unless that ship is equipped and certified to operate an approved alternative compliance system, for example a scrubber. The Association also said that there was no reason why ships without alternative compliance methods should have high-sulfur fuel in their tanks and that if it were an offence to do so then PSCs would have to be able to take direct action such as detaining vessels until they debunker the non-compliant fuel and insisting that compliant fuel is bunkered. “This would be a very powerful deterrent,” said the IBIA, noting that MEPC 70 agreed to have the subject examined by its Sub-Committee on Pollution Prevention and Response (PPR) when it meets in January 2017 as part of a plan for effective implementation of the global cap. The CE Delft study commissioned by the IMO predicted that by 2020 ships equipped with scrubbers will consume about 11% of total global demand for HFO and that liquefied natural gas (LNG) will account for about 4% of total global marine fuel consumption. Several of the major oil suppliers are now seriously considering expanding their LNG supply activities in response to noticeable interest from shipping companies in adopting LNG as a marine fuel. It is also likely that the expected price difference between compliant fuel and HFO (for which demand is expected to drop dramatically in 2020) will lead to more ships installing scrubbers prior to the implementation date. “This could serve to reduce the initial sharp drop-off in HFO demand and help ease a subsequent supply/demand mismatch. It remains to be seen if this proposal will be heeded as part of the effort to make the transition to the new global low-sulfur regime a bit smoother,” the IBIA concluded. The IMO has yet to respond (as of December 14, 2016) to the various reservations that have been expressed about its proposals.